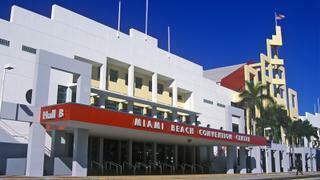 Miami Beach Convention Center’s impressive art deco façade. Image courtesy of Shutterstock. 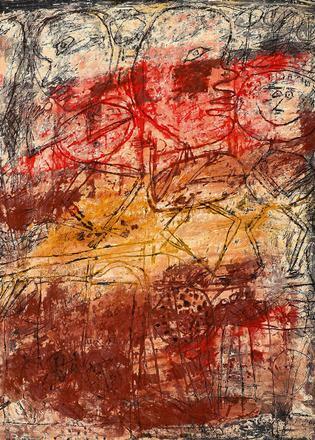 Jean Dubuffet’s La Vie à la Campagne, 1949. Image courteys of Gallerie Applicat-Prazan, Paris. Buttercut by Lucy Dodd, 2016. Image courtesy of the artist and David Lewis. Latin American Cult, European version, by Edgardo Antonio Vigo, 1975. Image courtesy Richard Saltoun Gallery. 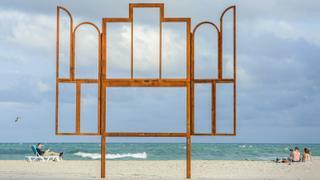 Kris Martin’s sculpture, Altar, on the beach. Image courtesy of Art Basel. Dawn Kasper performs in Turin in 2014. Image courtesy of the artist and David Lewis. 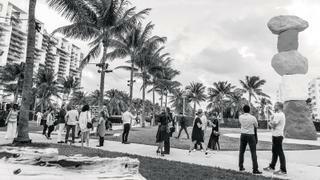 When Art Basel Miami Beach opens this year – at 11am on 6 December to its First Choice or VVIP list, that afternoon to other collectors and on the 7th to the rest of the world – it may strike regulars as rather different. As always, the most significant art fair in the Americas will bring together a lot of galleries – 268 from 32 countries – but don’t assume they’ll necessarily be found where they were last year. Within the Miami Beach Convention Center, the exhibition layout is entirely new, as is much of the interior architecture. Booths will be larger, aisles wider, and there’ll be more alluring facilities for dining and lounges for respite from the throng; 20 galleries will also be showing here for the first time. Take time to seek out the following highlights in the four main sectors of the fair: Galleries, Nova, Positions and Survey. The main and most prestigious body of the fair is the Galleries sector, which features 198 dealers this year. It’s rare for a new gallery to be selected without having shown in one of the peripheral sections first, but Paris-based Applicat-Prazan is sufficiently distinguished to be included here on its first application. With premises on the Rive Gauche and on Avenue Matignon in the 8th arrondissement, it specialises in Modern European painting of the post-war period – artists such as Asger Jorn, Wifredo Lam, André Masson and Serge Poliakoff – and this year presents an intriguing show of works by Jean Dubuffet, Jean Fautrier, Otto Freundlich, Alberto Magnelli, Manolo Millares, Jean-Paul Riopelle and Nicolas de Staël. The second largest section of the fair, Nova will showcase 29 exhibitors, each presenting new work by up to three living artists. Among the newcomers, Asia is represented by Tokyo’s Takuro Someya Contemporary Art and its display of colourful impasto-rich abstract paintings by Kenjiro Okazaki. From Europe, the Portuguese gallery Múrias Centeno will be exhibiting works by the Welsh artist Dan Rees, who works with Plasticine as well as oils to create reliefs that have the look of abstract paintings, though he also finds inspiration in nature. Brussels-based Dépendance, on the other hand, promises more figurative and conceptual work. Peter Wächtler is a German artist whose practice is concerned with language and narrative. Alongside will be works of art by two Britons: Ed Atkins, who uses computer-generated images to make videos (his best work is arguably a series of compelling scripted monologues delivered by talking-head avatars); and the Turner Prize-nominated painter Gillian Carnegie. Two New York galleries will also be in Nova for the first time. Tyler Rollins Fine Art has a never-before-seen installation by the Filipino artist Manuel Ocampo, who has said he “wants to push the conventions of painting to the point of ridicule… to go beyond thought” and whose provocative works often combine religious iconography and kitsch with political and literary narratives. Meanwhile, David Lewis Gallery will present works by the US performance artists Dawn Kasper and Lucy Dodd, a painter who makes work in gallery settings, so transforming the act of creation into a performance and turning the stand into a studio, or what she calls “a space of ritual action and improvisation”. 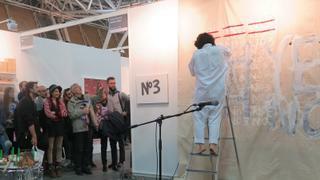 The 14 galleries in the Positions sector are permitted to present just “one major project by a single artist”. Here you’ll find debutants from across the globe. From Asia, the Shanghai gallery Antenna Space is bringing work by the printmaker and ceramic artist Xu Qu, whose pot sculptures seek to examine the influence of religion on life in modern China. 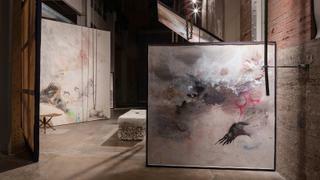 Tokyo’s Taro Nasu is showing figurative paintings by Koichi Enomoto. With their stylised, wide-eyed human figures, they seem at first to speak of manga and kawaii, the term for the saccharine cuteness that defines so much Japanese popular culture. Look again, though, and there are sinister forces at work. In contrast, Buenos Aires-based Isla Flotante’s stand features collage-like paintings by the Argentinian artist Mariela Scafati, who uses abstract geometric forms and repetitious patterns to create works that are not always immediately legible records of her life. There’s also a significant US presence. New York’s Chapter NY is showing a performance installation by the conceptual artist Adam Gordon, whose practice “focuses on the construction of experience”. The object here is to persuade visitors by means of a document to try to identify a woman who wanders the fair and is herself the work of art, or at least part of it. Born in the US to Mexican and Colombian parents, Harold Mendez is making a large-scale mural for the Chicago-based gallery Patron’s stand. While two other US galleries, Los Angeles-based Anat Ebgi and Houston’s Inman Gallery will be showing installations by two African-American artists, respectively Detroit-born Jibade-Khalil Huffman, whose theme is the black male figure in art history, literature and film, and Texas-born Jamal Cyrus, who will be exploring the politics of black American music and its role in the civil rights movement. If Nova is dedicated to new work, the art in the Survey sector has all been made before 2000. This year six of its 16 exhibitors have never shown at ABMB. Of these, London-based Offer Waterman’s survey of works by the great late-20th century British sculptor William Turnbull (1922-2012), whose estate it represents, promises to be a highlight of the whole fair. Turnbull began his career in 1939 as an illustrator at DC Thomson, the Scottish publisher of The Dandy and The Beano comics, joined the RAF in 1941 and served as a pilot in India and Ceylon. His subsequent paintings – blocks of vibrant colour divided by a vertical line – may look abstract, but in some respects they are stylised views of rivers bisecting the tropical and arid landscapes he saw from the cockpit of the planes he flew. He is best known, however, for his sculpture, a considerable body of work that ranged from his early linear pieces, belying the influence of his friend Alberto Giacometti, who he met in Paris in 1948, to his later, more substantial figurative bronzes and steel-based minimalist works. Also showing for the first time here are two other eminent London dealers: Hales Gallery, which is exhibiting paintings by the distinguished Guyana-born British artist Frank Bowling (born 1936); and Richard Saltoun, which will showcase works by Edgardo Antonio Vigo (1928-97), a leading figure in the Latin American avant-garde. 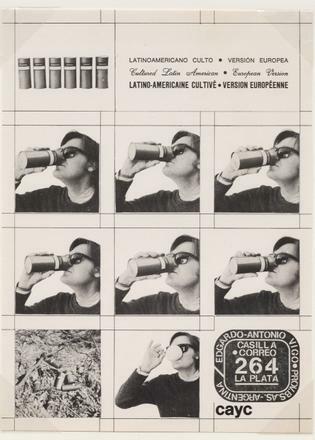 There’s also a chance to discover the work of two Brazilian artists: São Paulo’s Galeria Jaqueline Martins has works by Letícia Parente (1930-1991), one of the pioneers of video as a medium; and Ricardo Camargo Galeria will be showing paintings by the Paulistano pop artist Wesley Duke Lee (1931-2010). Keep an eye out too for Ceysson & Bénétière from Paris, which has an exhibition of Claude Viallat’s richly coloured patterned abstracts and Noël Dolla’s more formally geometric forms, while at A arte Invernizzi from Milan there are works by the Italian artist Dadamaino (1930-2004), one of Italy’s foremost proponents of Op Art, as well as her near contemporary Mario Nigro (1917-1992). Miami Art Week has much more to offer than what’s found in the Miami Beach Convention Center. There are more than 20 satellite fairs scattered around town, from the Art Miami and CONTEXT fairs that draw almost 100,000 people (make sure you attend the Art Miami preview party on the evening of Tuesday 5 December as many of the best pieces sell before the show opens) to the smaller fairs like NADA, for emerging artists, and SCOPE, which is set up on the sand of Miami Beach. Also spend time in Design Miami, which showcases the best in contemporary furniture and design. For an outdoor break, plan a relaxing walk through Collins Park for its annual exhibition of outdoor sculpture curated by galleries in the fair. Lastly, no Art Basel expedition is complete without a walking tour of Wynwood to see the large-scale graffiti and street art that coats buildings and spills from its numerous quirky galleries. Start at Wynwood Walls and be sure to hit the Salty Donut for a tasty sweet tea and lemonade or a more traditional brown butter and salt doughnut. Satellite fairs often change location each year so download the Art Finder Miami app powered by the Miami Herald for maps and information. Part of the pleasure of visiting an art fair is just to wander the aisles until your eye is caught by something: the better to discover works and artists serendipitously. In light of the sheer scale of the fair and the quantity of work on offer, aspiring collectors might, however, want to approach it more strategically, by employing an adviser. Wenty (short for Wentworth) Beaumont and Hugo Nathan, both formerly of the London-based gallery Dickinson (a specialist in old masters and not consequently a fixture at ABMB), founded their independent advisory Beaumont Nathan in London in 2014. Since then their five-strong team has advised on transactions totalling well in excess of $100 million, providing market intelligence to, attending fairs with, negotiating on behalf of, even bidding at auction for their clients. Combined, their expertise stretches from old masters to what the trade calls PWC, for post-war and contemporary. So, of course, they’ll be at Art Basel Miami Beach this winter.